One of Japan’s most famous living cartoonists, Shigeru Mizuki is a master manga artist with an incredible talent for highly animated characters, richly detailed environments, and captivating stories rooted in Japanese history and mythology. Drawn & Quarterly has been translating and reprinting Mizuki’s manga in handsome English editions since 2011, and after recently concluding the Showa series chronicling the history of Japan from 1926 to 1989, D&Q is releasing another one of Mizuki’s historical manga. 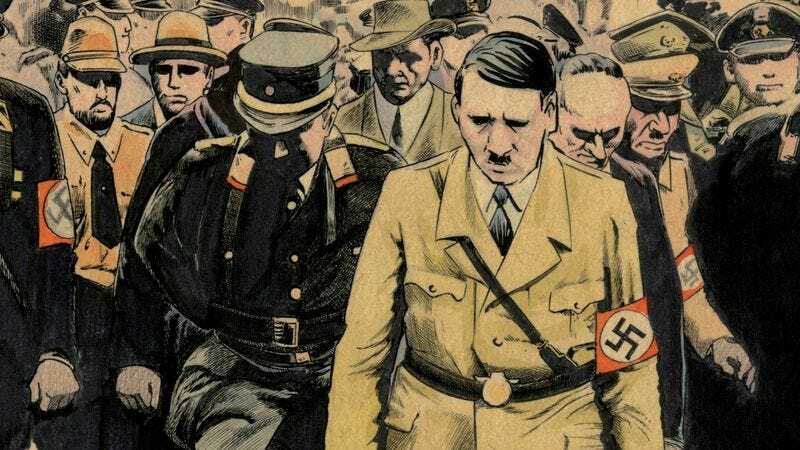 Shigeru Mizuki’s Hitler is Zack Davisson’s translation of Gekiga Hittorā, Mizuki’s biography of Adolf Hitler originally published in 1971, an intensely researched, impeccably rendered exploration of the dictator’s rise and fall from power. Hitting comic shops this week, it’s an essential piece for Mizuki fans, but also a stirring introduction for new readers to the work of a manga pioneer. This preview highlights Mizuki’s visual storytelling as it shows Hitler’s time in the prison where he wrote Mein Kampf and the his political manipulation when his sentence ends. Mizuki captures Hitler’s grandiose self-image with his full-page illustration of Hitler slaying a dragon after finishing his manifesto, but that fantasy image is a stark contrast to how Mizuki draws Hitler in reality: dopey, sad, and often pathetic. Hitler looks distraught even when he’s whistling with pleasure, suggesting that its impossible for the man to be truly happy when so much of his life is fueled by hate.